I have probably mentioned on more than one occasion how much I love homemade granola. Maybe you got the idea after I posted All Things Granola. 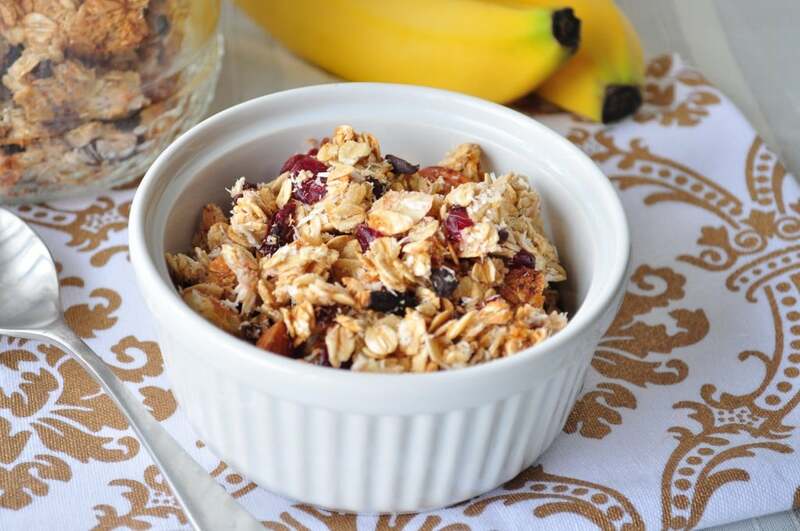 Not only is homemade granola a great way to start your day, but it makes a great little snack in the afternoon when you are craving something sweet. This is my latest homemade granola recipe. If you like cranberries and coconut, you will love this homemade granola. This recipe doesn’t make much more than 2-3 servings so if you want, feel free to double the batch. Granola would also taste great on top of my Chia Seed Pudding. Mix all the dry ingredients in one bowl . Mix wet in another. Add wet to dry and mix until everything is coated. Spread mixture onto a lined baking sheet . Bake in the oven for about 30 minutes. Shake pan about halfway through. If the granola is not crunchy enough, feel free to cook a bit longer. May seem like a silly question but did you use fresh cranberries or dried? No questions are silly. :) I used dried for this recipe. I am not a nutritionist, but I did do a rough calculation and I got about 150 calories per serving. Where are you able to find dried cranberries without sweeteners added? I can make my own once fresh are available but until then, I can't make this!!! I get them in bulk at Whole Foods. I never even thought that there were added sweeteners! Now I need to go look at the label next time I go there. I will let you know what I find out. This is seriously the best granola I have ever had! I love all the flavors together. I like my granola really crunchy, so I made sure it was all really spread out and separated on the baking sheet and stirred it every 10 minutes. It baked about 35 minutes in all. So crunchy, sweet and delicious! Thank you Melissa! You are so welcome Christy! I was wondering if I could substitute the honey with rice syrup or maybe even maple syrup? I am vegan and I'm one of those that doesn't eat honey. Do you think those substitutes would work? Love your blog and all your recipes. I'm eating my tofu stirfry with your teriyaki sauce and its delish! Awesome! Glad you like it! I think either one of those sweeteners will work just fine. Can it be made into a granola bar? I haven't tried. You may need to add a few more ingredients to help bind it. I have this in the oven now and it smells delicious!